The Second Age: Does Some Civility Still Exist in Washington? Does Some Civility Still Exist in Washington? In an age of extreme political incivility, when politics is based not on policy but on talking points, sound bites, retorts, and inflammatory rhetoric, it is very rare to see genuine friendship and respect among opposing parties' members. But Tom Coburn (R-OK), one of the most obstructionist Senators in history and a fierce opponent of nearly every government initiative, recently spoke out against incivility and blind hatred. 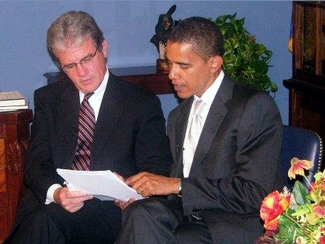 On C-SPAN, Coburn noted his close personal friendship with President Obama (a stronger one, he said, than his friendship with George W. Bush). And at an Oklahoma town meeting, he actually defended House Speaker Nancy Pelosi against boos and jeers from the crowd. He even called out Fox News on its proliferation of misinformation (specifically, that you will go to jail if you don't have health insurance). This certainly brings an air of hope to the state of politics in our country. Evan Bayh (D-IN) lamented the lack of civility in the Senate shortly after he announced his resignation in February, and cited it as a key reason for his departure. But maybe Coburn has galvanized a trend toward the revitalization of the stately and dignified institution that the Senate once was. Sure, Congressmen are always campaigning, and to do so, must always be defending their votes and finding fault with their opponents. But that doesn't warrant the extreme boorishness that exists in both Houses today. Democrats and Republicans alike can learn something from Coburn, and start to grow out of their pre-Kindergarten tendencies so that we can actually have some civil discourse in this country and come up with some good ideas and policies. Not everyone will agree on them, of course, but debating them in a constructive and thoughtful way sure as hell beats "You lie!"